A couple of looks inspired by one of my favorite interior designed spaces - this closet. If you are looking for other ways to wear winter white - you might like these styles inspired by a white kitchen. Love this soft color palette with a super loud + fun shoe! My favorite shoe! Thanks, Ashley. Such a dream closet! Great inspiration. It is. Thanks, Amy Ann. 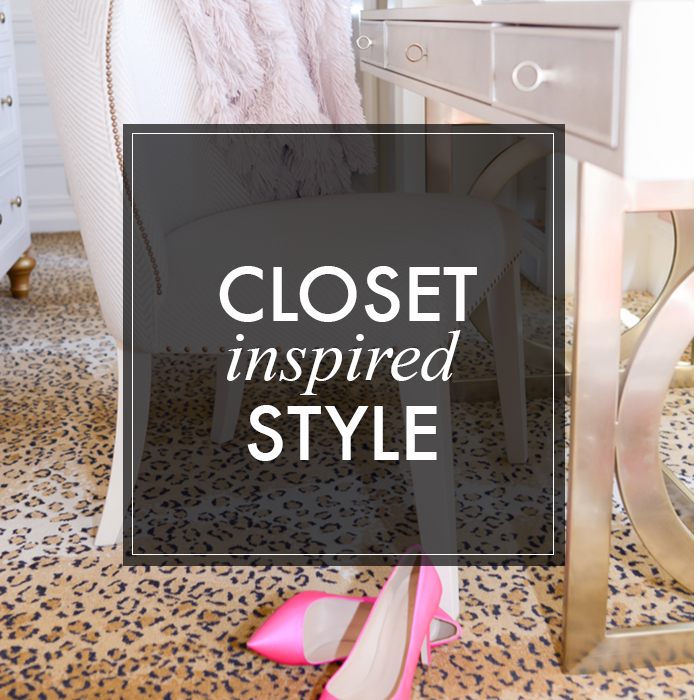 those items would be in my dream closet too! I'm loving those leopard pumps!! They are my favorite. Thanks, Maggie. Loving this color combo! Great soft pink faux fur coat and pop of color with the pink little bag! Amazing collection, love the style here, so fashion! That closet is crazy! It looks like a boutique! I love the palette you picked! The winter white with pops of hot pink or animal...delicious! That coat is everything, and I am obsessed with everything light pink right now! Love these picks Lisa. That fur jacket is gorgeous! Such a great look that you put together! I love the color scheme you picked, it's so dreamy and girly! Kate Spade fits in perfectly, was just browsing their sale, and it was so hard to resist! I could easily and willingly live in that closet and call it HOME. Holy smokes! Leopard carpeting? Chandelier? Pink pumps? Oh, yeah, baby! And the only thing missing about your lovely outfits is YOU! They would be even prettier on you. Love that fluffy jacket. Like wearing a pink Puli pup.